HAPPPPPY NEW YEAR...Yeah yeah......now 6th baru wanna wish ah? Mamarazzi baru start work today ma. Been slacking for two months. Like my school Principal says, brain also "karat"(rusted) already. Hence, starting this week I had to go to "school" loh though others had an extra week off. Loads of "basi"(stale) posts coming up....and this is one of it. 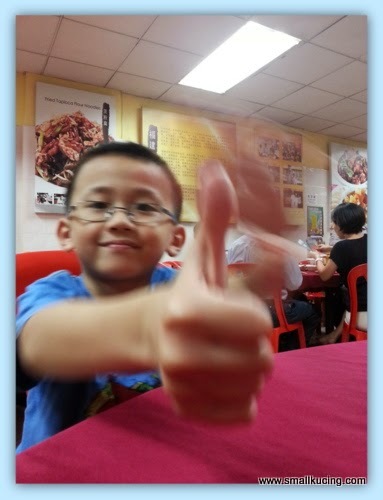 We went to this Restaurant Hua Xing sometime in Oct/Nov last year. First time here......it's on the first floor of a "complex". Haven't discover where to park the car yet. Round the block a few times and finally got lucky. A car left and we managed to get a parking . Simple restaurant. No worries on what to eat here coz can just point. Loads of photos of the dishes they offer pasted on the wall. But heard this place is famous for Bittergourd Hokkien Mee. Yup....you heard it right... BITTERGOURD Hokkien mee. I was apprehensive at first....come on la...which kid likes bittergourd leh...some adults don't like bittergourd, let alone kid la. Papa ordered portion for two...hmmm...portion just nice for small eater la. It was really lips smacking good. One plate was not enough for the three of us. Papa had to ordered one more plate of this for me. 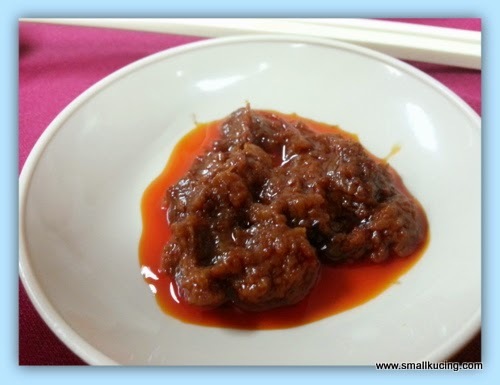 Papa and Mamarazzi said the sambal belacan goes really well with the Hokkien Mee. Papa who usually shuns the sambal belacan asked for more from the lady boss there. While waiting for the second plate of Bittergourd Hokkien Mee, we had this friend Tang Hoon. Hmmmm.....what is it in English ah? Is it Glass Noodle? Mamarazzi didn't quite like it coz she said too oily. Maybe because we ate this after having the hokkien mee la. The dish had cool down and become oily. If eat while warm should be great. Papa polished off this dish accompanied by the delicious sambal belacan while Mamarazzi and me polished off the second plate of Hokkien Mee. While on the way to the car, we stopped by an Indian Sundry shop which located near the restaurant. Sayang(pity) hor if wanna break these coin box..but that's what they did back then. Do you still have any of these coin box? Mamarazzi still have one piggy bank which she hids from me. Opens for lunch and dinner. Closed on Wednesdays. Hi Mama Kucing, good morning, u're back!!! Happy New Year!!! Normally the sales guys park inside the building lor.. Then take the lift up.. RM2 or 3 per entry.. I have such animal coin box when I were small too but I dont remember what is it. I remember my other siblings have a rabbit and a snail. Yaloh. Need to smash the whole thing if want to take out the coins. Haha. Hmm. Usually fried glass noodle is very oily. I also dont like my fried to be too oily. I dont like my fried food to be too oily. 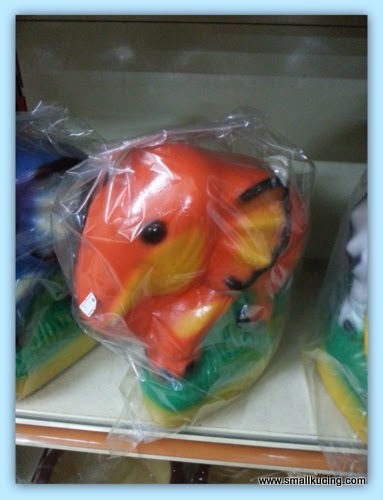 I had that kind of animal coin box too but I forgot what us it. I remember my other siblings have a snail and a rabbit. Yaloh need to smash it if want to take out the coins. Happy New Year! 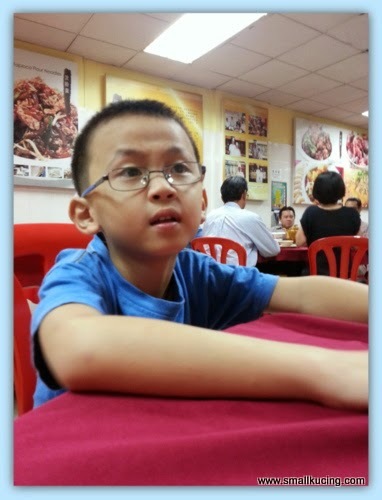 I loved going with you to the restaurant, and appreciate you explaining some things Leh! I like cellophane noodles, also "long Rice" noodle too. Wishing you all the best. Year of Wood Ram next up! October/November last year? Aiyorrrr...history liao lor! Hehehehehehe!!!! Hokkien mee looks good, sure with sambal belacan best lah. Lebih pedas, lebih bagus! School holiday no time and no mood to blog leh. Whoa...these coin boxes epic la...Last time we have to play in the fun fair in order to win them. Great way to start the new year!! Best wishes for a super 2015!! Good morning and a Happy New Year to you and family! 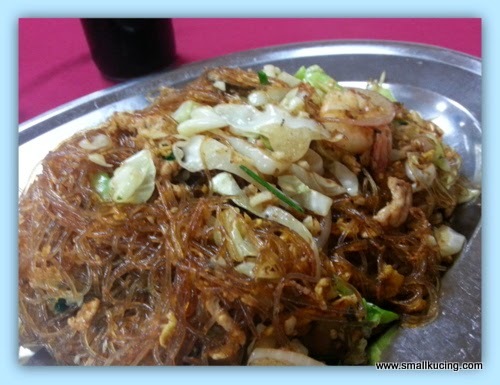 Hokkien Mee- my favourite and I think I would love this dish. aiyer...why lari leh...after frying in hokkien mee the bitterness gone liao ler. Happy New Year! I am surprised you like the Bittergourd Hokkien Mee. I guess the bittergourd was not bitter, right? I would enjoy it too because I like bittergourd. That coin box is unique lah. I have never seen one like that and some more got to break it to get the money out. Usual bittergourd dont like but this one hokkien mee me likey a lot. Ya after "mun" in the noodle so long the bittergourd no more bitter but still bit crunchy. Happy New Year Small Kucing and family! 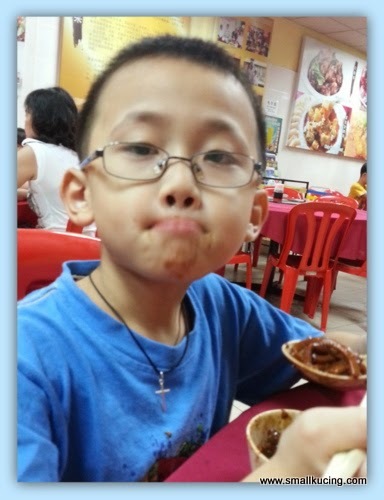 i like bittergourd (even as a kid)...especially when it is cooked as yong tau foo! 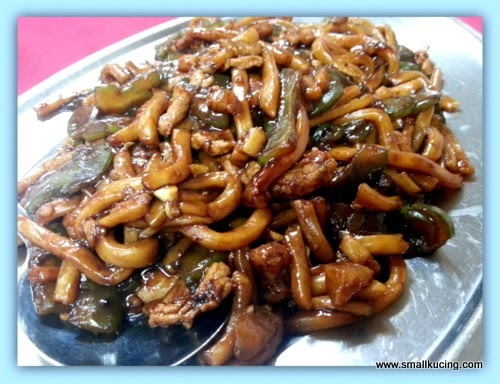 The fried tang hoon looks really moist and huge plate, sure very filling! You are growing every day! Do you like school? Yes, we have seen the cute banks that you have to break to get the coins. I think that is done so kids will save their money. First time seeing bitter gourd in noodles but indeed sounds fabulous. Must take my hub to try and I'm sure he will love. For me, its definitely the sambal belacan. Happy new year to you and everyone at home. TC. yea they have a few other types of noodles and dishes too. Interesting! 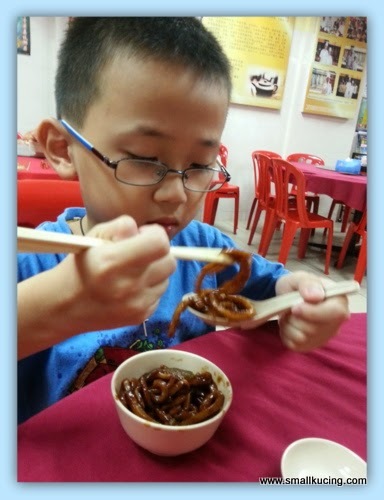 that hokkien mee sure looks convincing! Happy new year to you and your family! I think the bitter gourd in the Hokkein mee no longer tastes bitter right? The sambal must be really tasty. Actually sambal really goes well with Hokkein mee. Happy New Year Mun. Yes doesnt really taste bitter anymore after "mun:" with the noodles. Is the hokkien mee got hint of bitterness? I had those money boxes before in various animals. 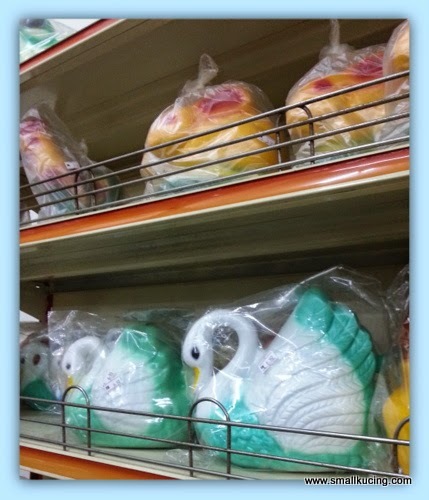 Those days they were all imported from China but I guess the ones on the shelves must be from local factories now. We call those coin boxes banks here. When I was young there were a lot of piggy banks.